The Triple, Five-Star Mandarin Oriental, Las Vegas is delighted to announce the launch of the new Jazz Sundays at MOzen Bistro and Mandarin Bar. The weekly get-together features live jazz music while guests indulge in a new brunch menu at MOzen and a special cocktail menu in Mandarin Bar’s stylish and lively atmosphere. Every Sunday, MOzen Bistro has a live jazz duo of guitarist and stand up bass along with a new all-you-can-enjoy brunch. The USD 58 per person menu offers fresh sushi, an elaborate seafood station featuring Crab claws and Kumomoto oysters, live carving options, traditional Dim Sum, a delectable dessert offering and entree favorites including the Hong Kong Style Steamed Grouper, Belgium Waffle with caramel pecan cream and the Soufflé Omelette. In addition to the exquisite cuisine, free flowing champagne for USD 35 and mimosas for USD 19 per person are available. 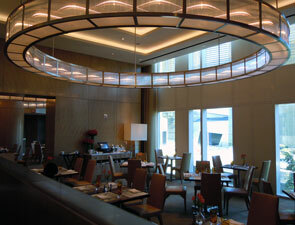 Brunch is from noon - 2:30 p.m. For reservations and more information, please call 702-590-8882. High above the world-famous Las Vegas Strip on the 23rd floor, Sunday evenings continue at Mandarin Bar from 4 - 8 p.m. with live jazz bands and new libation offerings. While enjoying an exhilarating ambience, guests will take pleasure in Mandarin Bar’s delicious light bites, domestic and import beers at USD 6, and expertly crafted cocktails for USD 14 including the Cherry Amour and Golden Leaf Martini which was created exclusively for the Mandarin Oriental, Las Vegas. Salvation Taco began brunch services this past weekend. The menu from chefs April Bloomfield & Roberto Santibañez is below and will be served Saturdays and Sundays from 11am - 5pm. Brunch dishes include toasted pumpkin bread, chilaquiles and fried rice with eggs, which can be paired with bright agua frescas such as one version with pineapple juice and mint. After brunch, guests can stick around for a round of ping pong. Tuesday/Feb 26: the cozy East Village restaurant will get in the spirit of Burgundy Week with a four-course White Burgundy dinner to celebrate the wines of the Chablis region down to the Cote de Beaune. Basil-purged snails get paired with Saint-Aubin & St. Romain, while Chablis will be enjoyed with Long Island Fluke Crudo with Winter Citrus. As Paul Grieco puts it, when it comes to Burgundy, terroir is “screaming through the grape juice.” Dinner begins at 7pm and is $126/person (all inclusive). To books tickets, call Hearth at 646.602.1300. Sun/Feb 24: The wine bar is throwing a 2013 Oscars Bash from 5-11pm. They’ll be showing the event live, offering wine specials, and there will be prizes for the best-dressed attendees. Guests should be on the lookout for popcorn and bingo to complete the night. Sat/Mar 2: The Tokaji wine region of Hungary will get its due credit with a wine dinner hosted by Judit Bodo of Bott Winery in Hungary. She’ll share her passion and knowledge throughout the night, which will feature a four-course meal of dishes such as braised pork belly, sauerkraut & house-made mustard with Furmint Bott wine. Dinner begins at 7pm and is $65 (excluding tax & gratuity). To book tickets, email Rienne at rmartinez@wineisterroir.com. Fri/Feb 22-Sun/Mar 3: All of Marco Canora and Paul Grieco’s restaurants will participate in NYC Beer Week, offering suggested pairings and focusing on as many New York and NYC-based breweries as possible. Terroir’s distinctive wine lists, known for their bulk, fun facts, bold prints and zaniness, have new additions, including a dedicated page to the late mayor Ed Koch (”the terroir of New York City”) and some playful political humor. 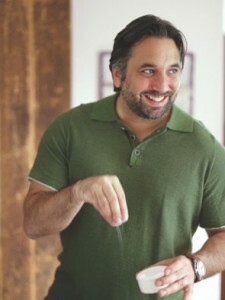 The pages can be found online here: http://restauranthearth.com/terrior/terroir-events.html. $3 Gazpacho Bloody Marys & Freshly Squeezed A La Minute Mimosas Jump Start a Weekend Brunch Not to Be Missed! At Barraca in the West Village, diners are eager to tuck into the comfortable, yet energetic space and enjoy the authentic flavors of Spain from Executive Chef Jesús Núñez. Since the October opening, the tapas, paella, and house-infused sangrias have gained a loyal following, and now Barraca has lifted the curtain for Act Two with weekend brunch. Running the gamut from dulces to huevos, Chef Núñez is offering a wide variety of options for anyone craving satisfying authentic Spanish flavors with a twist. Núñez’s take on Pancakes is anything but ordinary, served with a pumpkin and orange zest marmalade that brightens up the whole dish and caramelized pumpkin seeds for that perfect crunch. Some other “dulce” offerings include Leche Frita, traditional fried milk bites from Madrid with cinnamon ice cream, Bunuelos de Viento, crispy dough bites served with hot chocolate and cream, and Filloas de Nocilla, Spanish crepes stuffed with hazelnut-milk chocolate cream. If it’s eggs you’re seeking, Huevos Rotos Con Tocino or “broken eggs” served with crispy potatoes, pork belly, fried green peppers and Tetilla cheese are sure to do the trick. 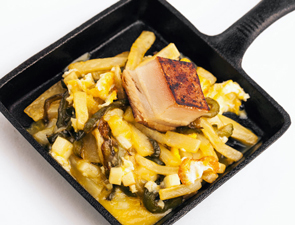 Upon arrival, diners are encouraged to mix everything together for a delectable bite of gooey, cheesy, porky goodness. The Huevos Revueltos uniquely combines both sweet and savory notes with scrambled eggs served with onion marmalade, raisins, Manchego cheese and piquillo peppers. Another not-to-be-missed item is the Sandwich de Pescado, a mile high creation of grilled skate fish in a spicy marinade, with preserved lemon mayonnaise, topped with a Brussels sprouts, pink radish and fresh scallion salad, sandwiched between homemade brioche bread. Barraca’s brunch menu also features a number of Tapas, Ensaladas, Cocas (Spanish pizzas), and other tried and true Spanish inspired entrées Brunch goers should not only come hungry, but thirsty. Barraca is bringing a whole new meaning to fresh squeezed orange juice with their high-end juice press. All imported Valencia orange and grapefruits will be squeezed “a la minute” for the freshest Cava mimosas you will find in any of the five boroughs. If tomatoes are your “poison,” the bloody marys are made with veggie-packed gazpacho, making for one rich and delicious hangover cure. The Fresh Squeezed Mimosas (orange and grapefruit) and the Gazpacho Bloody Marys are $3 on Saturday and Sunday brunch. Barraca is serving brunch on Saturdays and Sundays from 11am-4pm. Barraca seats 80 and is open for dinner from 5pm to 11pm Sunday - Thursday and 5pm - 3am Friday and Saturday. Lunch service is set to debut soon. 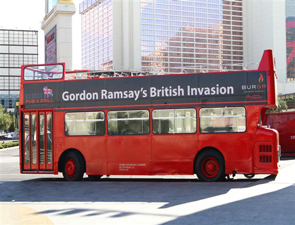 Celebrated Chef Gordon Ramsay took over the Las Vegas Strip yesterday as he traveled between his two newest restaurants in an appropriately themed red, double decker bus to celebrate the openings of Gordon Ramsay Pub & Grill at Caesars Palace and Gordon Ramsay BurGR at Planet Hollywood Resort & Casino. Ramsay showcased the ingredients and methods that differentiate Gordon Ramsay BurGR at Planet Hollywood Resort & Casino from any other burgers in Las Vegas. At Gordon Ramsay Pub & Grill at Caesars Palace, Ramsay introduced the traditional British Sunday Roast to the Las Vegas Strip complete with roasted prime beef rib eye, fingerling potatoes, parsnips, minted English peas and classic Yorkshire pudding. The opening of Gordon Ramsay Pub & Grill at Caesars Palace® on Dec. 18 and BurGR Gordon Ramsay at Planet Hollywood Resort & Casino on Dec. 22 follows the highly successful opening of Gordon Ramsay Steak at Paris Las Vegas last May. This is the first time that the Las Vegas Strip has welcomed two different restaurants in two different locations opening within a week of each other from the same chef. The newest restaurant openings mark three Gordon Ramsay restaurants to open in Las Vegas in less than a year, expanding his relationship with Caesars Entertainment Corp.
“The two things missing on the strip were a great burger restaurant and an authentic pub & grill, so we’re very excited to be opening these two very different, but equally vibrant new restaurants in Vegas for guests to enjoy,” said Ramsay. Gordon Ramsay Pub & Grill, the neighborhood restaurant conceptualized by the award-winning chef, opened Dec. 18. The 290 seat restaurant offers the UK chef’s take on an authentic English pub experience in Las Vegas. Under the culinary leadership of Executive Chef Jeremy Berlin, the novel pub and grill concept presents as if it is two unique restaurants. The grill section of the restaurant features a relaxed and friendly setting with dishes including Scottish salmon, lamb T-bone, Irish beef cheek stew with spotted dog and potted triple chocolate trifle for dessert. The pub features elevated British pub food in a comfortable and lively setting showing sporting events from across the world on state of the art entertainment systems. The pub includes 24 beers served on tap plus 63 bottled beers including a selection of large format varieties. With an eye towards dishes that pair well with beer, the pub menu includes English ale onion soup, shepherd’s pie, sausages, and the classic pub fish and chips. The center piece of the restaurant is a striking bar with an array of beer taps and a backdrop reminiscent of iconic British telephone booths. A patio area extends the restaurant towards the casino floor where guests can be part of the action. Tabletops are comprised of rustic, pottery inspired dishes layered with unprocessed woods and rugged serving vessels. The uniforms are inspired by the English punk scene and feature a number of multi-media pieces designed by Allison Leach, a continuing trend with Gordon Ramsay’s Las Vegas restaurants. With proximity to the Colosseum, the entrance of The Forum Shops and the self-parking garage, the restaurant is a convenient location for both locals and visitors enjoying Caesars Palace amenities. Four days after the opening of Gordon Ramsay Pub & Grill, the celebrated chef opened his first burger experience restaurant, Gordon Ramsay BurGR at the center-Strip Planet Hollywood Resort & Casino. BurGR, a name that plays on the celebrity chef’s initials, is located steps from the famous Las Vegas Strip at the entrance of Planet Hollywood Resort & Casino adjacent to the Extra! Lounge. The BurGR menu takes the traditional burger, fries and milkshake comfort food combination to an entirely new level with selections like pork belly bao buns, sweet potato fries with vanilla powdered sugar and pudding shakes-a heavenly combination of thick milkshake and silky pudding. Whether traditional or unique burger preparations they are be crafted using the freshest, quality ingredients. Paying special attention to not only the ingredients but the method, beef patties are cooked over an open flame fueled by hard woods, BurGR is the only gourmet burger restaurant on the Strip to use this technique, creating a more complex and powerful flavor. Not to be neglected, the beverage program features an extensive beer list and robust cocktail program. Focusing primarily on small and large format American craft beers, BurGR serves 30 beers-all from a stunning frozen tap wall-with a selection of bottled beer. The cocktail program features a selection of traditionally made cocktails, crafted with fresh ingredients with made-from scratch syrups. With a location that draws on the energy of both the casino and the nearby Miracle Mile shops, the room is designed in a youthful way with a stylish and modern ambience. The vividly colored room seats 200 and is be accented by an undulated ceiling, steel and concrete floor and open kitchen. The uniforms, designed by Allison Leach, contrast the bright colors of the restaurant with their muted tones. 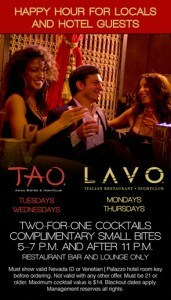 TAO Asian Bistro and LAVO Italian Restaurant have announced a locals and Venetian/Palazzo hotel guest happy hour. On Tuesdays and Wednesdays at TAO and Monday and Thursdays at LAVO, guests can enjoy two-for-one cocktails and complimentary small bites from 5 pm to 7 pm and after 11 pm at the restaurant bars and lounges. Guests must show their Nevada ID or Venetian/Palazzo room key before ordering to receive the happy hour special. Grimaldi’s Pizzeria, famous for its award-winning, hand-tossed, coal-fired brick oven pizzas and calzones, is adding special menu items. Bruschetta Pizza, Reese’s Peanut Butter Cup Cheesecake and Bailey’s Irish Cream Cheesecake will be the featured menu items for the month of February. 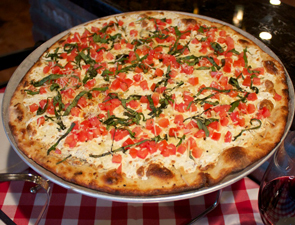 Grimaldi’s famous white pizza topped with diced Roma tomatoes, chopped basil and grated parmesan. 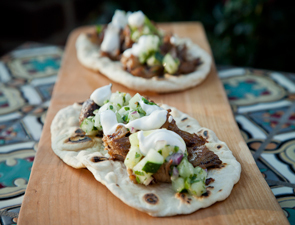 Try drizzling it with balsamic vinegar & oil, for a spectacular burst of flavor. Creamy vanilla cheesecake sprinkled with chunks of Reese’s Peanut Butter Cups and topped with whipped cream. Rich and smooth Bailey’s Irish Cream cheesecake in an Oreo cookie crust and topped with whipped cream. Additionally, Grimaldi’s will offer wine specials with discounts on a different wine every day. Grimaldi’s Pizzeria will continue to offer its traditional dessert menu for guests to choose from which includes: Tiramisu, Housemade Cheesecakes-New York Style or Oreo Cookie-priced at $5 each and Grimaldi’s Famous Cannoli for $4.50. The fit is natural enough as Norris continues to push for changes in the way fish is sourced and caught not only in the Pacific Northwest, but everywhere - something that garnered Riffle NW ‘Catch of the Year’ from Portland Monthly. 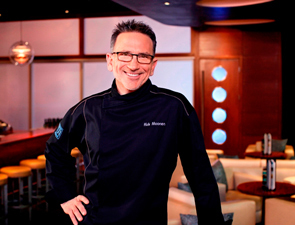 As for Moonen, the former Top Chef Masters contestant and Top Chef judge has garnered accolades for himself and his restaurant, Rick Moonen’s rm seafood at Mandalay Bay Resort and Casino, since 2005. In 2008, Moonen published Fish without a Doubt a practical, hands-on guide to buying, preparing and cooking a wide variety of seafood. This incredibly unique dinner at Riffle NW will feature six courses - three dishes from each chef in an alternating manner - a dessert, plus a chowder amuse from each chef, because what’s a Rick Moonen dinner without his signature dish? As Riffle NW is known for its ambitious cocktail program under bar manager Brandon Josie, a 50-dollar ‘Drinks’ pairing is optional for the meal. The imbibing menu will have both a couple of Josie’s concoctions as well as a few wines. It’s a playful way to pair drinks with the ambitious food that will include lobster burrata, a Thai papaya salad with seared scallops, oysters and a branzino from Chef Moonen that will delight Riffle NW regulars used to Norris’s take, among other items. Norris too is excited for Moonen’s arrival, as it’s another way to focus on how seafood is caught, cared for and consumed. To book your seat, contact Riffle NW at 503-984-8978 or email them at info@rifflenw.com. Cost for the dinner: $95. The highly-anticipated, world’s first Nobu Hotel at Caesars Palace Las Vegas is set to open and welcome its first guests on Feb. 4, 2013. 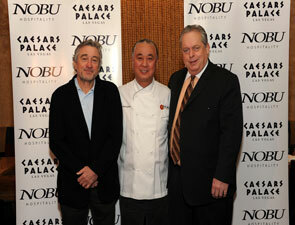 A masterful collaboration between Caesars Palace, Chef Nobu Matsuhisa and Nobu Hospitality primary shareholders, actor Robert De Niro and Hollywood film producer Meir Teper, the 181-room boutique hotel, along with a 12,775 square foot Nobu Restaurant and Lounge - the largest Nobu restaurant worldwide and the first on the famed Strip - will bring a new level of luxury, culture, sophistication and great cuisine to Las Vegas. Developed in collaboration with Nobu Hospitality and Caesars Palace, Nobu Hotel will be the first celebrity chef-branded hotel venture in Las Vegas. David Rockwell and his firm the Rockwell Group are leading the overall interior design for the boutique hotel, which includes 181 guest rooms and suites. Guest rooms will offer stunning views with designs that embrace comfortable simplicity with natural materials and textures counter-balanced with outsized elements to reveal a touch of Vegas flair. Eighteen luxury suites will range from one-bedroom, 1,000 square feet, to five-bedroom, 3,500 square feet configurations and will be available for guests seeking premium accommodations or a stunning venue to host an unforgettable special event. Room reservations are now being taken at www.NobuCaesarsPalace.com. The interactive website allows guests to not only book a room but also explore the various rooms and suites and browse hotel amenities and offerings. Showcasing Nobu’s first-ever in-room dining menu, exclusive amenities and guest privileges, Nobu Hotel will be centrally located within Caesars Palace, just steps away from Las Vegas’ world-class entertainment, luxury shopping and gaming.